Writing is an art of expressing emotions with the use of words. A writer needs to be creative and sensitive with his use of words. And it is not necessary that only a writer need to express his emotions using words. In fact, anyone can give it a shot writing their emotions or anything which comes to their mind. Writing is a good form of sharing one’s thinking in a piece of paper, it is beneficial even when a person is all alone. Moreover, when certain things are tough to be shared, then they should write their thoughts on a piece of paper. 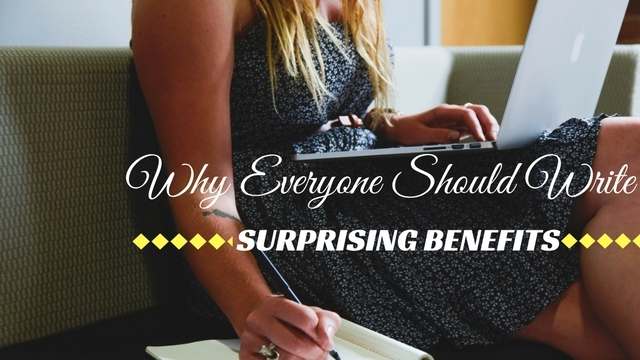 There are several beneficial reasons for writing daily. And they are as follows. Some people believe that writing things might be a little boring than any other work. But they just don’t know the fact is that writing things on a piece of paper can be considered as one of the best way to release stress. It prevents all sorts of negative thoughts from mind and generates all the positive elements in a person’s mind and soul. Therefore, it is necessary to understand the value of writing on a daily basis without any issues. Whenever someone feels like sharing something with people and they get time to do that, then it one way that they can share it with. And that is with the help of writing things on paper. Moreover, when a person is upset about certain things, then they should take their frustration out through the help of these writing things. It is one of the best ways of relaxing one’s mind and soul without any other costly methods. Not just emotionally writing things on a daily basis, even if it is common stuff, then a person will definitely improve your writing skills. Excellent writing skill is a skills which requires times and words. It is like taking time to write something beautiful using impressive words. Therefore, it is necessary to write on a daily basis to provide oneself a feeling of calm and peace. Moreover, at the end it is like meditation that can be delivered with the help of words. People even can start earning with their ability of using words as the form of their emotions. Some people are really good with their words and that is why they present their feeling in a way that a reader enjoys the moment of those words even without being in the moment. Therefore, write with that ability to connect with people can take a shot of being a writer so that he can represent the words of his values and culture. Most of the people feel comfortable by talking their heart out, but there are some people who don’t like to share their emotions by talking and wasting their energy on others. And those people find a way that where they can share their emotions with their words. It can always provide inner peace whoever believe in writing can make one feel happy about themselves. Moreover, it is way of talking without any sound or noise. This is only possible with writing therapy. Writing in any language helps one improve their communication skill. Sometimes in certain speaking classes they provide details about certain things and ask all the students to write about that stuff in a given language so that they can start communicating better with the help of these a piece of paper. Therefore, written communication is a quite effective way of communication to those who feel uncomfortable talking to people in front of them. In this way there are many advantages of written communication. People nowadays are so busy with their life that they need technology to help them in each stage of their life. Finally they tend to strive for a time where they survive even without technology. And that is why some people believe that writing things on a paper provide soothing feeling to oneself. Therefore, it is necessary to spare some time for oneself without any involvement of technology and to do that a person need to develop good writing skills to make better living. There is a possibility that if a person starts writing their stuff which is daily routines and some other personal stuff, then it is possible that they meet themselves in a more personal manner. Therefore, writing process is a therapy where a person can find their own being without any help of the doctors or the rest of people. Moreover, it is one of the forms of wake up call to a brain system to know that he is a human not a machine to live like a robot. There are people who doesn’t remember their dream because it is an interesting fact of dreams that people forget that dream once they wake up of that dream. But there is a possibility that one can recall such dreams with the help of effective writing skills. Therefore, it is necessary encourage someone to write their personal and professional stuff on anything they prefer writing it on. Moreover, it doesn’t matter what form, the things which matters is that its words and emotions. Writing improves several different things in one’s life such as personal and professional elements of a man’s life. But writing things and sharing one’s feeling can definitely provide feeling of positive consciousness. A positive consciousness creates positive environment for person so that he can survive a whole day that level of consciousness. Therefore, it is necessary write something on anything unless it is written using words. Finally, the bottom line is that at the end of this discussion over reasons and benefits of writing would definitely make a conclusion that creative writing is one of the best thing or a form of exercise for a healthy mind and soul. Therefore, people who struggle through their life and feel like sharing their emotions or feel like writing anything that matters, then they should start writing so that they can make themselves happy and motivated.